My Life Was Ruined by Cipro Poisoning! My life has been ruined by Cipro Poisoning!! There is nothing funny about it. I was a very active healthy adult who a few hours after taking cipro had leg spasms and a feeling like hot knives all over my body. I called the Dr. the nurse told me I was over reacting because I had had bad reactions to Darvocet and a steroid cream previously. So I continued for 3 more days. I began to have heart palpitations and just hoped to die and then I couldn't walk at all!!!. I Called the dr back and the nurse sighed very loudly and said just wait. She put me on hold and came back and said why didn't you tell us you were sensitive to medications before??? I said I have never taken medications before she said that explains a lot just stop taking them. My husband called the doctor later and was told I couldn't be seem by any doctor for 6 months until the drug worked out of my system. He has called every entity FDA, Bayer- no one can tell us anything. I have always been very natural and even natural remedies don't work. I cant drive or walk on my own. My strength is totally absent. I lost my business. I no longer eat meat or animal products cause the drugs are in them. I can't drink, bath or swim because the fluoride in the water aggravates the conditions. Now the really bad thing is I'm getting the reputation of being crazy because I'm so careful about what I can drink or eat or even do because any kind of exertion aggravates the cipro poisoning. I have an Aunt who is now experiencing cipro poisoning too, and even worse she is loosing her teeth 9 -so far and her anxiety is off the chart. 2 friends of mine have the same symptoms as me looking in their past is cipro & levaquin. One friend has torn shoulder and I told her not to take Cipro before. I am being told it eventually leaves my body and my symptom and heals in 2-4 years but I don't think so. This has been going on for over a year. I am 50 but have always been mistaken for someone 30. Is there any hope for me?? I would appreciate only advice on things that have worked for others. My husband is so very kind and I couldn't have survived with out him. But he isn't a fan of natural medicine. He wants me to see more doctors but I've seen too many and they always make it worse. My heart goes out to anyone reading this because it means you are on a very tragic journey.! I am learning this has been going on for 40 years under different drug names but he same criminal Cipro Poisoning!! Comments for My Life Was Ruined by Cipro Poisoning! I'm SO sorry to hear about your health from the Ciprofloxacin Side Effects. I wish that more people were aware of these problems before they took them- and that's what I am trying to do here is to educate people so that they don't have to go through what you are going through. The biggest problem, though, is that people still just don't believe it can happen to them. I've even heard people taking it who KNOW about these problems say, "I'm taking it, but I'm being careful." Ughhh. If they only knew that they were playing Russian Roulette with their health, they just wouldn't take it. On a good note, I have helped enough people with this problem that my partner and I developed The Levaquin Tendonitis Solution in order to help people recover. I suggest that you take a look because most people who have used natural remedies just simply don't use them in the right ways or use the right doses- even if they actually use the correct supplements, which most do not. 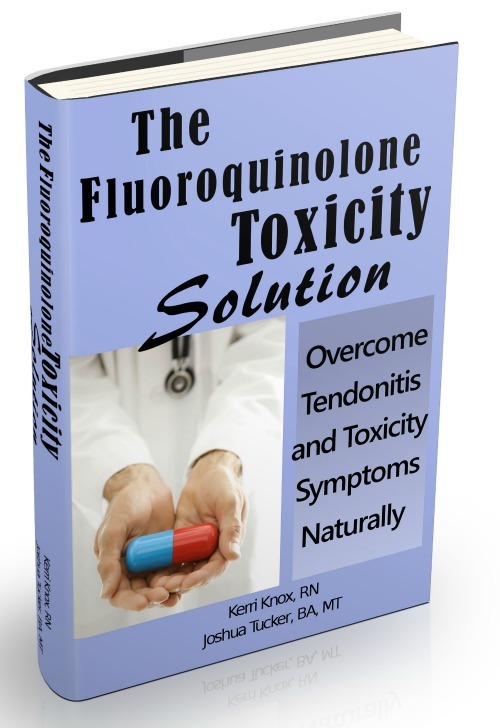 So, in the book, I outline how to strengthen your body again and reverse not only your symptoms but the reason WHY you got Levaquin Toxicity to begin with. This is the key to getting better and the reason that this program works and why other things that you've tried haven't. Take a look.. I had tendon issues with it's Levaquin. Now there's class action suits against it. So sorry u had issues with this one. These are very dangerous drugs. And when you tell docs you had problems, torn tendons, they look at you like you're crazy. Wishing you the best. I've been doing this stuff for 12 years and doing better. A little bit older than you. Also, find a good ND I f u can. It's work, but worth it.